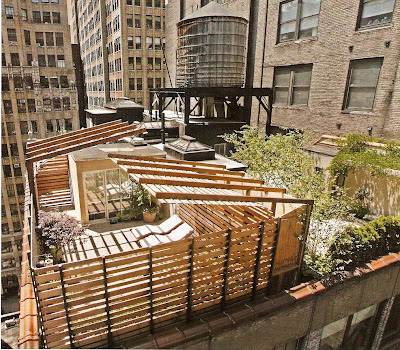 This gorgeous rooftop "room" in New York City is amazing! (via Metropolitian Home magazine) A small space in it's own right (500 sq ft), this space allows the homeowner to enjoy a room that serves multiple purposes - relaxation/entertaining/enjoyment. The use of eco-friendly materials only adds to this one-of-my-favorite spaces ever! And interestingly enough, the horizontal slated wood design creates vertical space, drawing your eye up to create a feeling of depth of space. 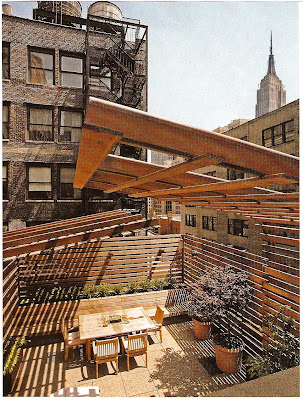 0 Responses to "SMALL OUTDOOR SPACE AT IT'S FINEST"